Amber The Rabbit: Image by Ke Wynn, FlickrRabbits are cute and playful animals that make great pets. However, there are a few things to consider before bringing one home to the family. Believe it or not, there are thousands of rabbits out there without a home. So, if you're looking to buy a rabbit, check your local rescue groups before running to the pet store. Adopting has some other benefits too. For one, rabbits (and other animals) are usually being kept in unsatisfactory conditions in pet stores, and often have contracted various illnesses. Also, it's generally easier to tell the personality of a rabbit if you adopt through a rescue group. If you're getting a pair, which is recommended, you're more likely to get a pair that has already bonded with each other. This will prevent fighting and other issues that can happen between rabbits. The common misconception about rabbits is that they're best kept outside, in a hutch. However, this isn't true. Rabbits can not only be litter trained to stay inside the house, but they're very social, and probably will be much happier inside with the family. There are a few options to house rabbits indoors. You can consider a puppy pen, a large cage, or a bunny condo. Believe it or not, rabbits can also be allowed free rein throughout the house like a cat or a dog. Just provide them an area to themselves in the house, with food, water, litter, and a place to play and be alone if they like. Also, if you allow your rabbit free rein, you'll need to "rabbit proof" the house to make sure they don't get into any trouble. 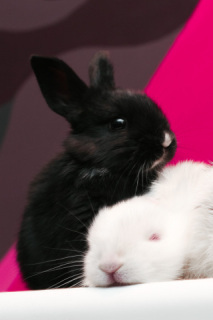 Kurosawa & Shirasawa: Image by Jiazi, FlickrRabbits are very social, and will likely need another rabbit to bond with. If not another rabbit, they'll need plenty of bonding time with you. If you go with the second rabbit option, great! Just be careful. Although rabbits are very social, they each have their own personalities, and they will attack each other if they don't get along. To avoid this, get your rabbits young and introduce them slowly, or buy a pair that has already bonded. 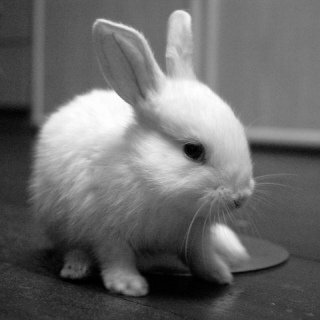 Rabbits are very active animals, and therefore will need plenty of space to run, play, and exercise. If you keep your rabbit in a cage or similar arrangement, make sure it has plenty of room for them to move around. Also, they should be allowed time out of their cage to play, exercise, and roam around. If your rabbit is a house rabbit, then don't worry, they'll have plenty of time and room to exercise. No matter what you choose, you should provide your rabbit with things to keep himself entertained and to prevent him from chewing on things he shouldn't. Some people use old phone books and empty toilet paper rolls for this purpose. Rabbits aren't necessarily as cheap as you might think. Not only that, but they can live for 10 years or more, so you're in it for the long haul. After initially buying you rabbit(s), you'll have to worry about housing, food, and litter costs. Not to mention the cost of veterinary care. If your bunny isn't already spayed or neutered, you'll have to get that taken care of to prevent aggression. On top of that, there are vaccination costs to consider. In some places, your rabbit will need 2 vaccinations a year. Rabbits are surprisingly friendly, and can make wonderful pets. If you think you're ready for a pet rabbit or two, take good care of them, and enjoy your new pets!